Bone armchair with brass suture detail. Made in the USA by Casey McCafferty. First two images show oxidized white oak. Third image shows oiled white oak. Fourth image shows oiled walnut (front) and oiled white oak. The Bone Collection was inspired by the concept of exposure: revealing the structure or "bones" of what lays beneath the surface. Bone Lounge Chair features a slab seat with loose cushion and the signature bone backrest. The collection’s details play between the skeleton’s slender bones and silky smooth curves, and the chunky, exposed faces of the seat edge and feet. Available finishes: Oiled black walnut, oiled white oak, bleached white oak, charred ash, oxidized COM (customers own material) or COL (customers own leather) is available upon request. Customization is available. Charges may apply. Available Finishes: Oiled Black Walnut, Oiled White Oak, Bleached White Oak, Charred Ash, Oxidized Maple COM (customers own material) or COL (customers own leather) is available upon request. Pair of very nice spindle back chairs with newly upholstered seats. 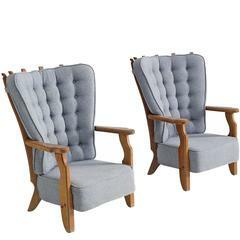 A handsome matching pair of super well made lounge chairs circa 1979. 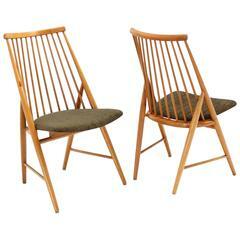 These feature solid oak frames and loose cushions in original fabric. Early, Ib Kofod-Larsen peacock or hoop lounge chair features a rounded, ebonized walnut frame with spindle back. The newly upholstered chenille seat cushion is 20 inches diameter. Gustav Stickley, L.&J.G. 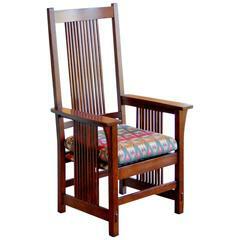 Stickley Inc.